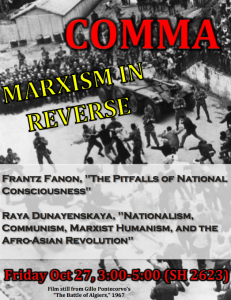 Now announcing the second meeting of the COMMA 2017-2018 Reading Group and Lecture Series MARXISM IN REVERSE. Through the year we will read the work of major Marxist critics “in reverse”, starting from the contemporaries and working our way back to Marx. Our second meeting will be on Friday October 27th, at 3:00pm in the Sankey Room, South Hall second floor.